3 sizes to fit everyone! Do you suffer from chronic foot pain? Achy feet, foot cramps, sore feet, plantar fasciitis or just general pain in your feet can prevent you from carrying out necessary daily tasks. The cause of foot pain can be attributed to a number of conditions such as hammer toes and bunions. 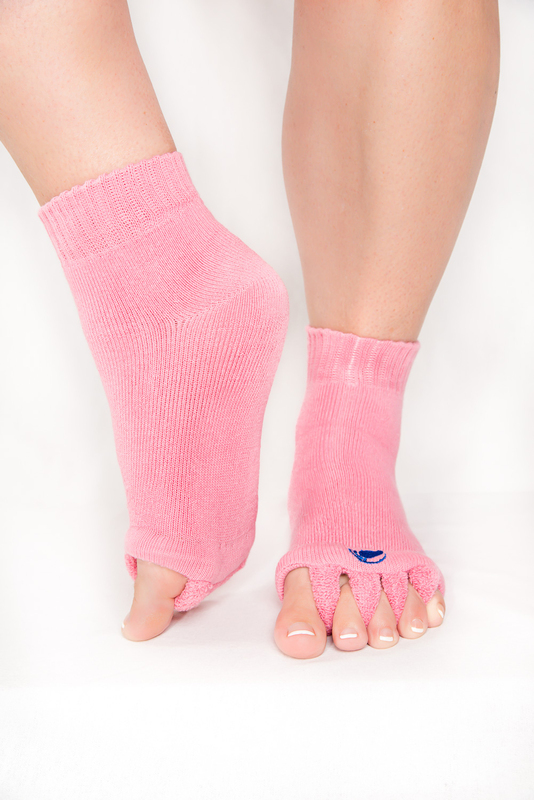 Overlapping toes can also put unnecessary strain on your feet, but these crooked toes can benefit from the toe alignment of The Original Foot Alignment Socks. Foot alignment socks can help! 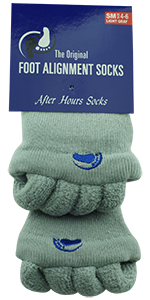 Foot alignment socks are a crew style sock and are made from either a soft cotton or acrylic blend fabric that includes four toe separators. Each separator gives the toes a gentle push to align them with the rest of your foot and back towards their more natural state. 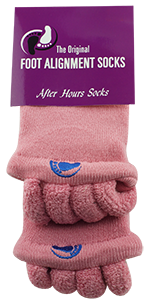 Available in a variety of colors, these socks are designed to be worn when relaxing to help relieve your unique cause of foot pain. 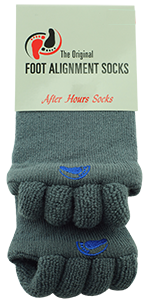 FREE us shipping for 2 pairs or more! MY TOES HAVE NEVER BEEN SO HAPPY!!! These socks have helped a great deal with my foot/Roe pain. I wherenthen when relaxing and during sleeping hours. Absolutely love them!! I love these socks. They are comfortable at each level of wear and have helped train my toes back to their proper position. I sleep in them every night. My feet, overall, no longer ache! 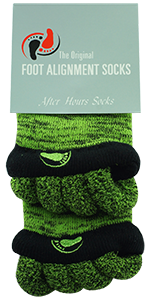 They are so nice and comfortable to put on When I put my feet up in the morning and evening! They stretch out my toes and my pinkies that were turned sideways are now straight again. HAPPY WITH MY ALIGNMENT SOCKS!!! I love my socks!!! I have several problems with my feet. 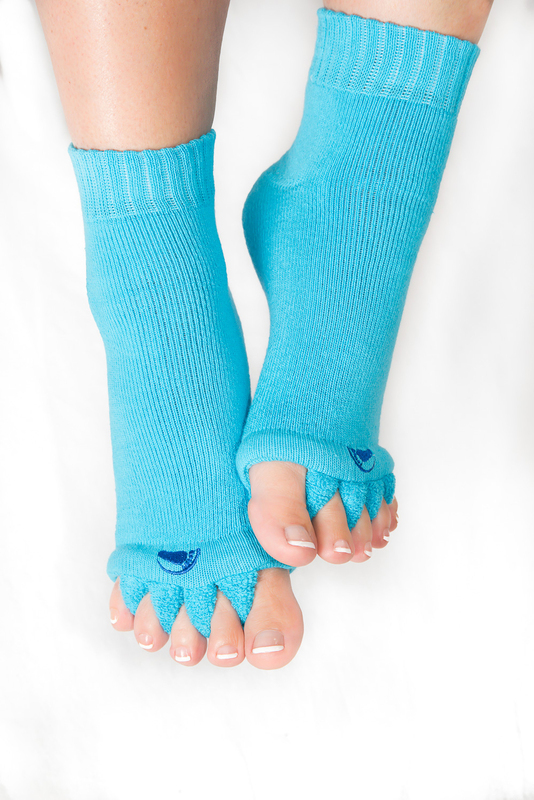 I have neuropathy and arthritis and these socks give me relief almost instantly, when I put them on. It's unreal how they work!! I am going to buy more when I can so that I can always have a pair with me. I was amazed how well these socks worked! I have bunions and my husband has terribly painful hammertoes. I bought us each a pair. I started wearing mine first to see if they really worked. 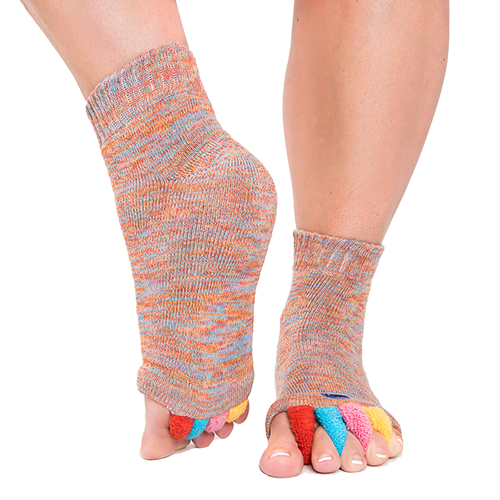 My bunion does not hurt all the time but when that nerve gets pinched I slip on my Happy Feet socks and voila it's like a miracle. For work I am often on my feet 12-14 hours a day. I had foot surgery 20 years ago and my feet have been hurting off and on since. I use these every night when I get in bed. I keep them on for 20-30 minutes and I can feel the relief. I would definitely buy again. In the beginning you should wear them daily for at least 15 minutes or as long as they are comfortable. A slight discomfort is OK, but they should not be painful. Just elevate your feet and relax. Gradually you will be able to extend the length of time. 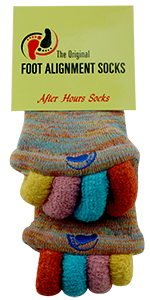 Depending on your feet, you may or may not be able to wear them overnight. When they start to bother you, remove them. What should I do when my feet keep hurting after I put the socks on? Most orders will ship within 1 business day from Cleveland Ohio and delivery can take from 1 to 5 days depending on your location. Our standard shipping is via First Class Mail with the US Postal Service. If you have a PO Box, please specify that on the order. International orders leave our warehouse on Tuesdays and Fridays with normal delivery times of 7 to 10 days but is often dependent on your local postal or delivery system. 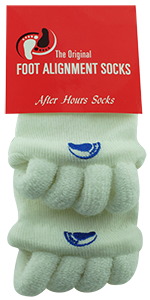 At My-HappyFeet.com, we realize that foot pain issues usually don't develop overnight. 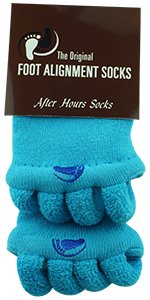 While many people put them on and experience relief within days, depending on what kind of issues you are facing, it may take some time for our foot alignment socks to provide relief. 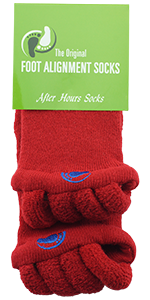 That is why we give you a full 60 days to allow the gentle stretching that the socks provide to have the most effect. 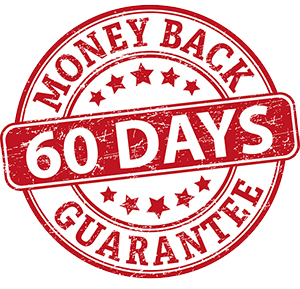 Simply return them and we will refund the full product price. What do you have to lose? Except foot pain! "Foot Alignment Socks" are not a substitution for medical treatment. For serious foot problems, see your Podiatrist or Doctor.